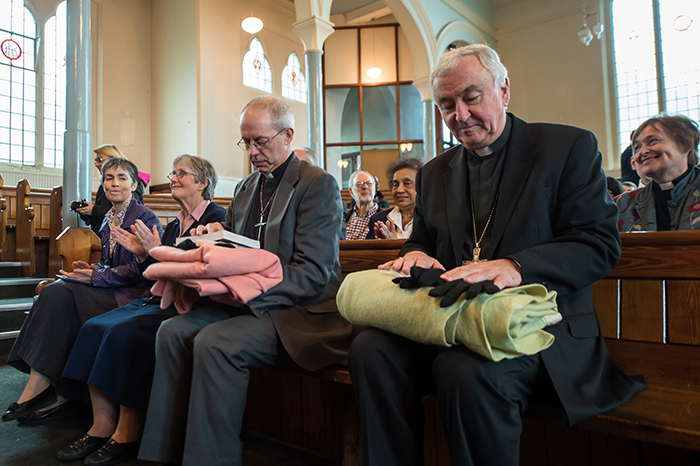 Cardinal Vincent Nichols and Archbishop Justin Welby have jointly launched an initiative this Lent to encourage people to pray for the work churches do to support those in their parishes and beyond. During this week Archbishop Justin and Cardinal Vincent will give also give thanks to God daily for this essential act of service and they will pray for his blessing on the work of churches serving people in need. Their aim is that by joining together in prayer and encouraging others to join them they will foster the work of the church in strengthening communities and helping those in need across the country. Cardinal Vincent Nichols and Archbishop Justin Welby will jointly visit two projects as part of their initiative this Lent to encourage people to pray for the work churches do to support those in their parishes and beyond. They will begin the week by visiting Giuseppe Conlon House on Passion Sunday (6th April) – a house which offers a place to stay in a Christian community for men who need a home whilst they work through immigration processes. On Palm Sunday (13th April), the two Archbishops will visit the Rainbow Centre in Folkestone, Kent. This Christian charity works to support families and individuals through times of crisis, and to invest in children’s early years and well being. During that week Archbishop Justin and Cardinal Vincent will give also give thanks to God daily for this essential act of service and they will pray for his blessing on the work of churches serving people in need. Their aim is that by joining together in prayer and encouraging others to join them they will foster the work of the church in strengthening communities and helping those in need across the country. If you would like to join them by committing to prayer, download the prayers and readings for the week in printable format now, or visit www.rcdow.org.uk or www.archbishopofcanterbury.org from April 6th – 13th for daily prayers and resources. On Day 6 Dr Paula Gooder, a writer and lecturer in Biblical Studies, reflects on today’s readings from Matthew’s Gospel on the parable of the sheep and the goats. Dr Paula reminds us of the care Jesus calls on us to place on those we meet in our lives. Day 7’s reflection is given by Fr Michael Dunne, Parish Priest of Our Lady and St Catherine of Sienna. Fr Michael speaks about Luke’s version of the Beatitudes and the call for those with wealth to satisfy the needs of the poor. Fr Michael also talks about his experience of helping to found a foodbank in Bow, a project undertaken with the help of people of different faiths, and the impact it is having on the community.